California seems to be experiencing one water disaster after another. On top of the drought, last month a 90-year-old water pipe ruptured on the UCLA campus leaking an estimated 20 million gallons of drinking water. On Sunday, a magnitude 6.0 earthquake damaged dozens of water pipes, leaving hundreds of Napa and Vallejo residents without water. These major incidents beg the question: how strong is our water infrastructure? According to a new report by the San Jose Mercury News, local water agencies are losing about 23 billion gallons of treated water each year. Most of that loss is attributed to aging pipelines that leak before reaching customer meters. “The system is aging,” Mercury News Science Reporter Lisa Kreiger told Michael Krasny on KQED’s Forum. Her analysis of water records shows Bay Area agencies lost between 3 and 16 percent of treated water in 2010. Now that the state is in a drought, these old, leaky pipes are gaining attention. “When water is precious, monitoring and stopping these losses becomes important,” Krieger said. 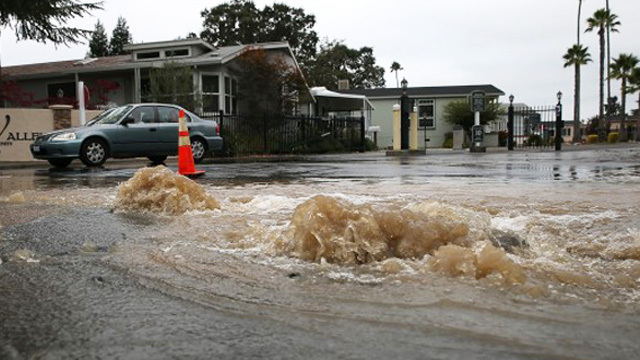 According to Krieger, the San Francisco Public Utilities Commission and East Bay Municipal Utility District have done a good job of reporting their water losses to the state. But reporting leaks and losses isn't mandatory in California, so many water districts aren't reporting them. "We really don't have a good grasp of what's going on here," she said. Much of the Bay Area's water system was built generations ago and is in need of repair and replacement. "Many of our pipes are 100 years old," said Steven Ritchie, assistant general manager of water for the SFPUC, which is currently replacing six miles of pipe each year and is aiming to increase to 15 miles each year. EBMUD has 4,200 miles of water pipeline and is currently replacing 10 miles of pipe each year. The utility is also using acoustic sensors called "loggers" to detect leaks. "We are at the dawn of the era of replacement," said Heather Cooley, with the Pacific Institute, a water policy think tank. Fixing the nation's broken water system would cost $700 billion over the next 20 years, she said. It's not just distribution systems that are in need of repair. California is wasting about 11 gallons of water per person per day on broken household systems like running toilets and leaking irrigation systems, Cooley said.